Is there a doctor in the house? 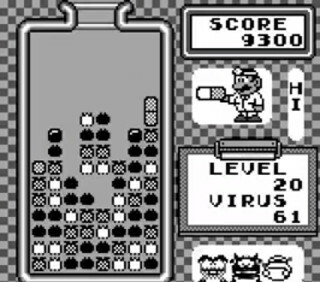 Dr. Mario made his first debut on the Nintendo Entertainment System, revealing to the world three things: 1) he has a PhD, 2) His dyed his hair blonde for this game only, and 3) it was a simple but fun Tetris-esque action-puzzle game. So, was the 1991 release for the portable Game Boy any good, perhaps better? Read on and find out! Some ugly viruses have been developing in a jar. Being a modern medicine man with a clear belief in the Hippocratic Oath, Dr. Mario decides to take a break from causing harm against not-so-innocent Goombas and Koopas to throw pills upon the ugly germs. 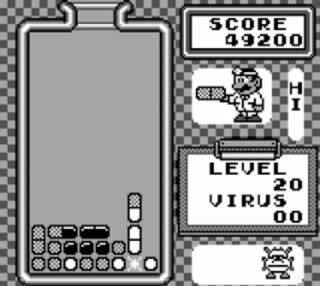 Players can modify the level to start on which consequently determines how many germs will appear, as well as alter the falling speed of the mega-vitamins. This means quacks and novices can try the game out at their own pace, whilst the skilled can embark in some medical mayhem whenever they feel like it. Two songs can be chosen, the first being the infectious tune ‘Chill’, or the main theme known as ‘Fever’. For those not up for any music, it can be turned off whilst sound effects remain. Pills will be tossed into the jar by the good doc, in which they will gradually descend. They will need rotating and fitting to create a horizontal or vertical line of four, eliminating anything of the same colour which are connected. This technique is key to eliminating all of the nasty germs. Defeating each of the nasties will grant points. Once they have all been defeated, the round is won, and the player may advance, often followed by a small cutscene congratulating the player after completing a level on the fifth, tenth, fifteenth or twentieth level, respectively. The port is otherwise spot-on compared to the original game. Whilst the Game Boy lacks colour, it won’t take long to get used to it; the red, yellow and blue pallets are replaced with black, white and a mix of the two. No other inclusions make their way into the game, which is disappointing. Sure, there may be a three-round multiplayer mode that could be pulled off with a system link cable, but it could have done with an extra mode or two. Perhaps a time attack mode to see how many points a player can earn with little time? Also, there is no way to speed up pills that topple down after knocking everything holding them up below. Not a major flaw, but something that could have been tweaked. The Game Boy port may not offer many extras, aisde from the ability to play the game on a portable console, but it’s still a dose of the good stuff. Whilst the game may feel repetitive after a game or two, it has quite a lot of replayability, since stacking away in a jar with decreasing space to slip in mega-vitamins does become a lot more challenging and tense further in to the game. It’s far from complex but remains as a fun distraction. On the whole, this 8-bit prescription is totally worth it! You can try it out on the original Game Boy, or bag it on the 3DS Virtual Console. A free, three-minute demo can be unlocked on the excellent cross-over fighting game Super Smash Bros. Wii U/3DS as well.